Gillingham manager Justin Edinburgh is confident teenage rising star Emmanuel Osadebe will fulfil his potential. Osadebe, 19, scored an eye-catching individual goal against Bury before being rewarded with a call-up to the Republic of Ireland Under-21 squad. 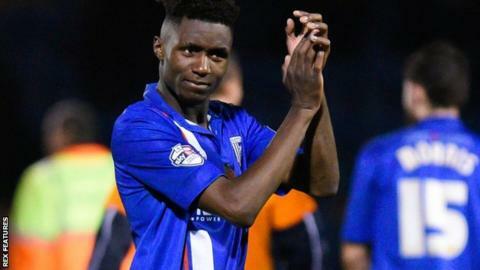 The midfielder has made only 13 appearances for the Gills since moving to the League One club in the summer. "He's a grounded boy. It's not been an easy journey for him to get here," Edinburgh told BBC Radio Kent. Osadebe secured his first professional contract with Gillingham following his move from Tottenham Hotspur's foundation college programme in May. "He's had a tough upbringing and he's very grateful for where he is right now," added Edinburgh, who has assistant David Kerslake to thank for recommending Osadebe to him. "He won't lose sight of what he needs to do to maintain what he's doing. "I think his international call-up is great recognition and reward for him. I'm sure it's going to be one of many for him in the future." Meanwhile, Edinburgh revealed striker Luke Norris is making "encouraging" progress in his recovery from an ankle injury, which has sidelined the 22-year-old since mid-October. "He's progressing very well and I'm delighted with his recovery and rehabilitation," Edinburgh said. "We were looking at 12 weeks out originally, but he's ahead of that and hopefully by mid-December he could be back in action."